The noble Castellan Crowe of the Grey Knights Chapter must wield the cursed Blade of Antwyr, an indestructable weapon imbued with evil daemonic power. Castellan Crowe, Brotherhood Champion of the Purifier order of the Grey Knights, bears a heavy burden – to be the warden of the dread Blade of Antwyr. Its malevolent voice is forever in his head, trying to crack his resolve, urging him to unleash a power he must never use. The toll is terrible – how long before the incorruptible Crowe is at last defeated? Under the command of Castellan Gavallan, Crowe and his brother Purifiers bring purging flame to a daemonic incursion that threatens to consume the world of Sandava I. However, what awaits them there is more insidious and more powerful than they imagine, and they must reckon too with the machinations of the Blade, as it seeks to destroy its guardian and drown the galaxy in blood. 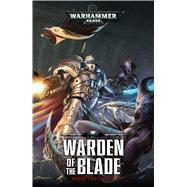 David Annandale is the author of the Horus Heresy novel The Damnation of Pythos, the Adeptus Titanicus novel Warlord and the Grey Knights books Sons of Titan and Warden of the Blade. He also writes the Commissar Yarrick series, which includes the novella Chains of Golgotha and the novels Imperial Creed and The Pyres of Armageddon. For the Space Marine Battles series, he has written the novels The Death of Antagonis and Overfiend, while he is also the author of three volumes in The Beast Arises series. David lectures at a Canadian university on subjects ranging from English literature to horror films and video games.